Thursday November 6th we woke up and went to breakfast at Animator’s Palate. It was bittersweet since we’d soon be leaving the ship. We said our goodbyes and gave lots of hugs. After breakfast it was time to disembark and again, Disney’s got it DOWN. We zipped off that ship, sailed through customs, found our luggage and were out the door in no time! When you disembark you have to fill out a customs form and read numerous warnings about things you can not take off the ship with you: fruit, vegetables, meat (who’s packing sausage? ), plants, animals, etc. Apparently there is a $50,000 fine if you break this rule. CSP is by nature very aware of posted rules and what not. So you can imagine how he about fainted when as soon as we got outside the ship terminal my Mom turns to us and says “Anyone want a banana?” and pulls bananas out of her bag! The shuttle came and got us and took us to the Hilton where we picked up Blanca and Papa’s Jeep. Then we drove to the Residence Inn, where we were staying the night that night. Papa checked on our rooms then we drove to Cocoa Village to have lunch and walk around. While there my Mom bought me the cutest thing. It’s a clip that you clip to your key ring. Then you clip the other end on your purse so your keys dangle from it. You’ll always find your keys! 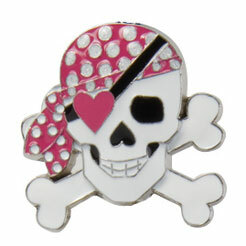 And it’s a girlie pirate. I love it! It was so weird, while walking around we could still feel the ship move! Like just a moment of woozy every now and then. Odd. Papa & Gigi also got us the coolest thing. I can’t find anything online that’s just like it, but this is close. Except ours has 2 crystals. Once CSP gets it hung up I’ll take a picture. While out and about we stopped at Ron Jon surf shop. CSP saw it when we first got into Cocoa Beach the week before and kept saying he wanted to go to the Ron Bon Jovi shop. Man, that place is HUGE! I picked up a tshirt for Momo there, then we went to the hotel. We unloaded all our luggage and took naps. After our naps we went to the pier for dinner at Atlantic Ocean Grille. We found these surf sculptures in the parking lot and couldn’t pass up a photo op! After dinner we headed back to the hotel. Papa & CSP watched sports while Gigi & I watched Tropic Thunder, then it was time for bed! I’ll ignore your flagrent suggestion that your family might be packing sausage – and the fact that your mom was smuggling bananas. Seriously, this post was amusingly ladden with innuendos! *laughing* But love the photos. Sounds like you had a wonderful, wonderful trip and you totally need to pick up scrapbooking again to put all these in an album!